Blitzen Trapper are arguably one of the hardest working (and most estranged in character) bands out today. With a relentless tour schedule that makes you wonder if Eric Earley and crew actually have homes to go back to, and what seems to be an “album a year” strategy going for them, they have definitely earned this title. But, the best is yet to come. Everyone’s favorite indie-folk group is due to release their fourth album, third from Sub Pop Records, very soon! And if “Love The Way You Walk Away” and it’s corresponding video are as impeccably brilliant and personable as the rest of the album, we are shaping up to hear what will be the definitive Blitzen Trapper album. These suave folk-smith warriors always seem to outshine themselves year in and year out. The video for “Love The Way You Walk Away” is very simple in nature. 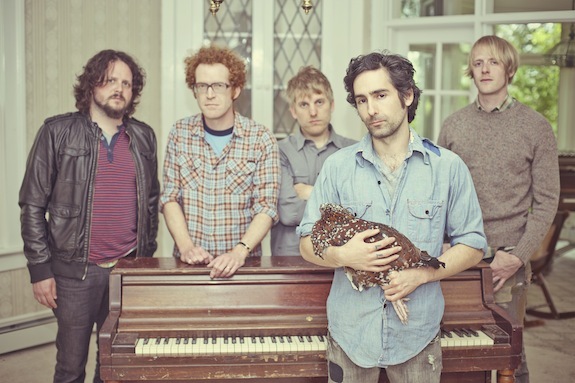 Classic tour footage of good times had, singing done, and classic 4-second blips of smiles and nips from flasks dominate the aura of a perfect visual demonstration of the world Blitzen Trapper has immersed themselves in over the last few years. But it is the down right spectacular song itself that steals the YouTube show here. Once again, Eric Earley proves that he is the prodigal son that Bob Dylan wishes he would have had (sorry Jakob, maybe try tennis?) as he spills out lyrics that are equal to if not greater than (at least reminiscent of) Mr. Zimmerman’s “One More Cup Of Coffee”. Blitzen Trapper has created a track that should definitely appeal to any person who has had the pleasure of seeing them perform live in their own city, or have felt as though Eric and crew have been speaking directly to them over for the better part of a decade. Whether they meant to or not, these guys have created an homage to the friends, family, and fans who have tried their best to show their support for all the hard work they have put into creating such wonderful and inspiring tunes. And if I may speak for my crew of beloved followers, I would like to say….thank you so damn much! Blitzen Trapper will release their fourth album, American Goldwing, on September 13th. The Afghan Whigs Share Video for "Demon in Profile"